The Vine Project - What is The Vine Project? What is The Vine Project? The Vine Project is a book written by Colin Marshall and Tony Payne. The Vine Project seeks to answer the question: how can we shape the whole culture at our church toward disciple-­making? The Vine Project is more than a book. keep the momentum going and overcome obstacles (Phase 5). The Vine Project could take 1­-2 years, but we want to emphasise that this is a continual process. The deep-rooted process of change should have effects for years to come. Like the gospel itself, it’s a continual process of new growth. The Vine Project has been developed on biblical principles of discipleship, and a tried and tested framework that has merged from real world experience and groundwork of coaching churches in many different areas and contexts. Why is The Vine Project different? The Vine Project is built on solid biblical principles of discipleship. It’s not a flash-in­-the-­pan approach. It’s not pragmatics or marketing dressed up in Christian jargon. Often churches address discipleship by adding another how­ to program or course into the mix. Sometimes, this makes for short­ term excitement or activity, but just as often, this sort of change fizzles out again and we’re back to square one. Change of this kind doesn’t take root because it doesn’t change the church culture—it just adds another thing for people to do. 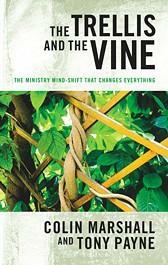 The Vine Project is a theologically driven approach to leading culture change. Rather than a superficial fix, it is a robust process that aims for deep­-rooted, wide­-ranging and Christ­-centred change. Some church growth programs are ultra prescriptive, in what you need to do, and when you need to do it. Some programs also aren’t flexible to ministries that can differ vastly in terms of people, resources, and cultural context. In contrast, The Vine Project is not a program or ministry model imported from the outside. It is an inside­-out approach to culture change, driven by the key leaders of your church, your Vine Project Team. The discussions, exercises and projects are all designed to enable your team to shape your ministry according to your local context. You can work at your own pace through the process, choosing which aspects of ministry development are most important for your situation. The Vine Project works equally well with big or small staff teams, churches of varying sizes, and with different denominations. It will help to shape the ministry culture of church plants as well as established churches. All you need to get started is a leader, and four to ten committed Christians, whether they are other ministry staff, lay leaders, elders – anyone committed to shaping your ministry culture around disciple-­making. As we’ve worked with different churches in different contexts, surprisingly similar stories emerged about the blockages and problems that churches have in implementing a discipleship culture. extra tools and templates to manage the planning and implementation process. You will also be connected to a worldwide fellowship of churches and leaders utilising The Vine Project, learning from each other about the pitfalls and progress of ministry culture change. In 2009, Matthias Media published a book called The Trellis and the Vine. It was a book about what ministry is, and why so many churches have become stuck in a ministry rut. The Trellis and the Vine struck a chord with many church pastors and leaders who saw that something drastic was needed to get churches going again: getting to the heart of the gospel, and the Great Commission. Overwhelmingly, pastors and leaders said to us that they loved The Trellis and the Vine, but what’s next? The Vine Project is what has emerged from that training and coaching experience. Visit the Vinegrowers website to learn more about the journey so far. Start the journey to explore discipleship in your church and gain access to in-depth discipleship resources and ministry tools - become a member today!